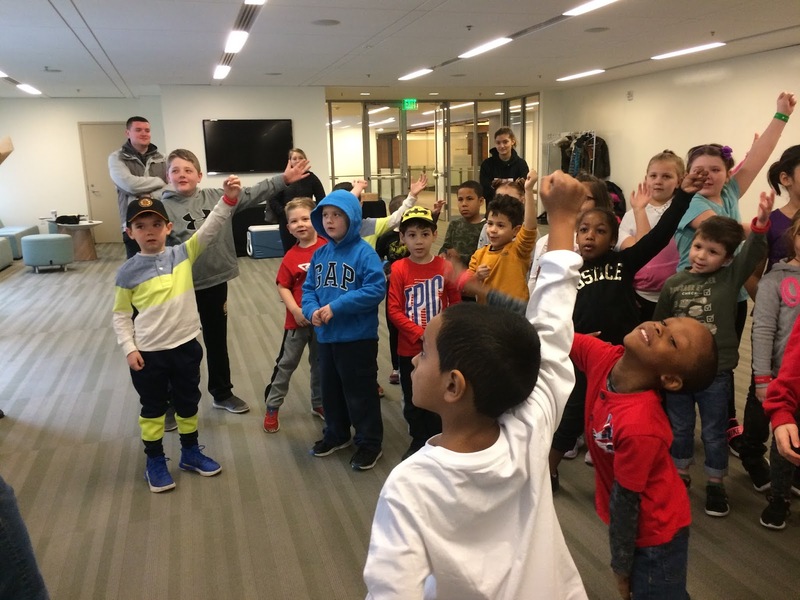 On Thursday, February 22, Atlantic Wharf and Boston Properties hosted Save the Harbor/Save the Bay's Boston Harbor Explorers' program for February Vacation Week Programming. Save the Harbor staff, youth and interns were joined by 30 kids from South Boston Neighborhood House for a morning of sea chanteys, art projects, stories, and of course an up close encounter with Louise the Lobster at the touch tank! Tony the Pirate telling the South Boston Neighborhood House kids the story of "Little Eyes" the magic crab. The day began with Tony the Pirate detailing the origins of crabs, jaguars, and vultures and teaching the kids how to sign different animals in sign language. 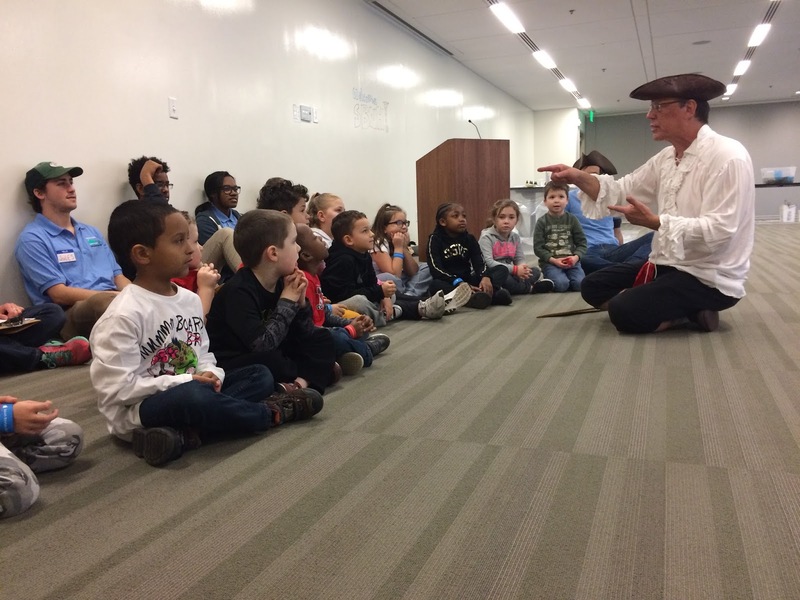 After Tony's stories, the kids learned and sang the official Save the Harbor sea chantey, "Haul Away Joe", a reminder that that when we all pull in the same direction we can get almost anything done, whether its raising the sail of a tall ship or cleaning up Boston Harbor! Once the kids were inspired and excited from singing together, they broke off into groups to learn more about the harborside. Each group took turns at different Boston Harbor- themed stations. The first station was fish printing, where the South Boston Neighborhood kids channeled their inner artist by making gyotaku fish prints with scup and mackerel. At the touch tank, kids had a chance to meet Louise the Lobster and a Bert the Rock Crab. The kids were delighted to learn about crabs' regenerative limbs and how to determine if a lobster is a female or a male. The kids also learned about the anatomy of the crustaceans, their diet, and their role in the ecosystem of Boston Harbor. Lobsters, crabs, and humans-- oh my! They even got to draw themselves as pirates, inspired by Tony's tales and Save the Harbor's "All Hands On Deck" broadsheet, which tells the stories of diverse young mariners and seafaring women. The masterpieces-- these kids make for some scary pirates! A successful day with South Boston Neighborhood House at Atlantic Wharf. Thanks also to James Hook & Co. for lending us Louise and Bert for the morning! 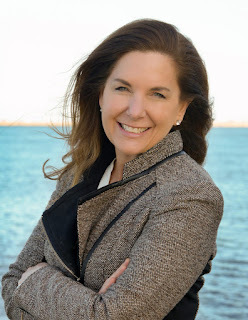 For more information on our Youth Programs and other similar events, visit savetheharbor.org and check out our blog - blog.savetheharbor.org.